Winter and fall weather often mean we are searching for more cost effective meals that are nourishing as well as hearty. 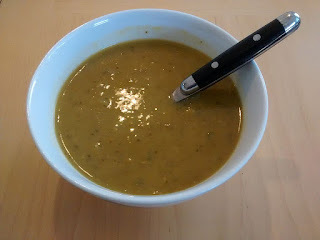 Split pea soup is one option when you are searching for an easy meal for your family. Split pea soup can be served by itself with salad or may be served with crackers, as a side dish to a complete meal or may be a meal in itself. Depending on how large a serving you are dishing out, you may find that it is hearty enough for the largest of appetites. If you are planning on serving pea soup as the main part of your meal, consider including ham in the recipe. Simply chop ham into bite sized chunks and add to the crock pot one hour before it is finished. Chop the salt pork into 2X2 cubes and lace in a pre-heated skillet. Add onions and saute until the onions are transparent. Stirring frequently will ensure the onions are not scorched.Once the onions are transparent, you may add them to the bottom of the crock pot. Note: This step is optional. You may cube the salt pork and place it into the crock pot with the vegetables if you desire. Using a colander with small holes, empty the bag of split peas into the colander under running cold water. Carefully examine and remove any rocks or other debris from the peas. Remember, that since peas are picked raw and typically by machine it is not unusual to find debris in them. Place into crock pot when finished. Important note: If you have elected to use whole peas instead of split peas, you may want to soak them overnight. This will keep the recipe from taking longer to cook. After preparing carrots and potatoes and rinsing, place them into the crock pot. Immediately empty water into the crock pot and add salt, pepper and bay leaves. Set crock pot to high and cook for six (6) hours. If you have decided to include ham in your pea soup, you should place it into the crock pot (chopped) at the beginning of the fifth (5th) hour of cooking. You may also place the ham into the crock pot at the beginning of the cooking stage if the ham is pre-cooked. Do not use raw pork. Remove the bay leaves from the crock pot and the pea soup is ready to serve. Serve piping hot with oyster crackers or Italian bread. If you are serving pea soup as a side dish, this recipe will serve 10 - 12 people. If you are serving it as a main meal, you can serve 6 with this recipe. Those who live in New England generally are opposed to serving (or being served) clam chowder that is anything except thick, rich and white. Many New England restaurants will offer "Manhattan Style" clam chowder which is tomato based. 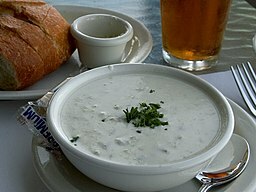 However, the preference is generally for New England Style Clam Chowder. Making clam chowder is not difficult; it can be made with fresh or canned clams and makes a hearty New England style go with or can be a meal all by itself. This recipe for clam chowder is simple to make and requires very little preparation time. If you elect to use fresh clams, the process is a bit more lengthy but it is still simple to make. Peel potatoes if desired. They do not have to be peeled. If you prefer to not peel, simply wash thoroughly, chop into either chunks or cubes to suit your individual taste and add to crock pot. Peel and dice onion to desired size and place into crock pot with potato. you are adding. Turn to high heat and allow to simmer for four (4) hours. Test potatoes for tenderness. When the potatoes are close to the desired tenderness, add to the crock pot the two cans of evaporated milk and the butter. You may also add additional salt and pepper if desired. Lower heat on crock pot to low and continue cooking for two hours. Store leftover clam chowder in the refrigerator in a tightly closed container. To reheat, place over low heat until warm. It is not recommended that you freeze chowder nor should you microwave as the milk may curdle. This recipe will make 8 large servings or 16 small servings.